Oregon lost last Saturday. They lost the game, a starting wide receiver and the blindside protection for Dakota Prukop. The Ducks lost a lot – but they did not lose the season. The next few months appear to be headed in one of two ways. 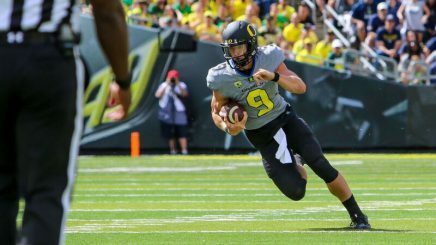 At times, the Ducks certainly look like a team that could lose more than four games, but comparatively they still have the potential to win the Pac-12 championship. The entire defensive unit needs to play better, and maybe they would if the same players were getting snaps every week. It’s hard to gage who the impact players are on a defense that has not really been a force in any game yet this season. With that in mind as the Ducks open conference play against Colorado on Saturday, here are the four players who could determine whether this season ends in Pasadena or in Albuquerque. 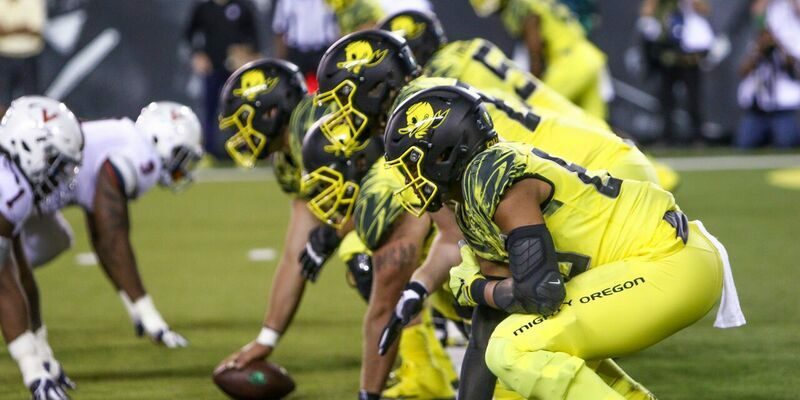 Pressure is on Prukop to lead Oregon offense. 1. Dakota Prukop: The statistics for Prukop seem like they belong to a quarterback on an undefeated team. After carving up two teams who have won one game combined between them, he faced a true test in Nebraska last week. The results were mixed. No one is going to blame Prukop for the loss, or at least they shouldn’t. Seemingly under pressure and running for his life almost every play, he still didn’t commit any turnovers (in fact, he has yet to commit one this season). Prukop ran for nearly 100 yards, but threw for only 146. He had more rushes than completions. In my article last week I wrote that a key for the Ducks to win the game was going to be big plays, but he averaged just 10 yards per completion. The opportunities were there too; Charles Nelson was open on a long pass for the go-ahead score, and he missed him. It all proves the point that if the Ducks are going to go anywhere the so-far-so-good Prukop will have to execute better on critical plays. Darren Carrington is an important piece of Oregon’s offensive production. 2. 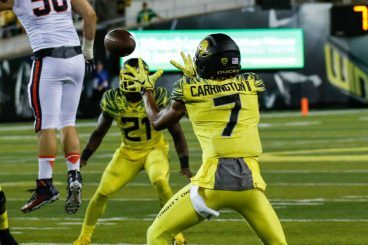 Darren Carrington: The number one wide receiver option for the Ducks has not produced as expected. If his numbers go up, so will the number of wins the Ducks have at the end of this season. In 2014 and 2015, Carrington averaged 19 yards per catch. This year it has dipped to 15 yards, as well as almost 17 yards less per game. More importantly, in 2015 Carrington played in only seven games but still managed to catch six touchdowns. This season Carrington has only one so far. 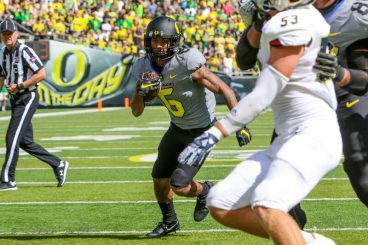 With the news that Devon Allen has a season-ending knee injury, the wide receiver corps for the Ducks has taken a major hit. This means Carrington will be getting more defensive attention from opposing teams. In his Oregon career he has seven-100 yard games, but only one this season (against UC Davis). At his best he plays the wide receiver position as well as anyone in the Pac-12, and to beat their toughest opponents he will need to play at that level. Charles Nelson can make big plays on special teams. 3. Nelson: There is no mistaking the threat No. 6 poses at wide receiver and his ability to make plays on offense, however his impact on special teams has (so far) been minimal. 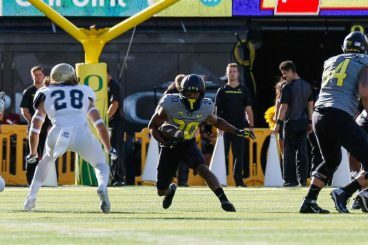 Placed on the Pac-12 all-conference team last year for his all-around play, the Ducks are still waiting for him to get into the end zone this season. Viewed by the coaching staff as a dynamic holder on PATs, he is given the responsibility for reading the defense and either kick or go for two. So far this season he has converted on three two-point conversion attempts, but only one of three in a game the Ducks lost by three points. Nelson’s best game so far was the opening game against UC Davis when he had 251 return yards. Every time he touched the ball it looked like he was going to score a touchdown. Even with that display of brilliance he had two fumbles in the game, one of which led to seven points for the opponent. Nelson did not have any turnovers against Nebraska, but his return average was half of what it was in the first two games. The entire conference knows that when the kickoff lands in his hands, the field (and the game for that matter) can flip in a matter of a few breaths. For the Ducks’ sake, that needs to start happening with regularity. 4. Tony Brooks-James: The wealth Oregon has at the running back position is seemingly incomparable. There is no doubt that when on the field Heisman trophy candidate Royce Freeman is the class of the group. However, Freeman’s lingering injury leaves some doubt about his ability to play, so the Ducks have to have a reliable second option that does not slow down the machine. Tony Brooks-James leads team in rushing touchdowns. While only a sophomore, Brooks-James has accounted for five touchdowns with limited carries this season, including three against Nebraska. If Freeman isn’t able to play consistently, Brooks-James will get more carries and the higher expectations that go along with them.